San Francisco, CA – June 2, 2010 – Presidio Pharmaceuticals, Inc. is pleased to announce that Pamela Vig, Ph.D. has joined the company as Senior Director of Clinical Research. San Francisco, CA – January 12, 2010 – Presidio Pharmaceuticals, Inc. is pleased to announce that Eric Ruby has joined the Company as Vice President of Regulatory Affairs. San Francisco, CA – August 5, 2009 – Presidio Pharmaceuticals, Inc. is pleased to announce that Dr. Nathaniel Brown has joined the Company as Senior Vice President of Clinical Development. 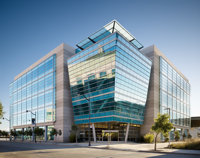 San Francisco, CA – December 5, 2007 – Presidio Pharmaceuticals, Inc. announced today that it has relocated its corporate headquarters to San Francisco’s Mission Bay campus.